A team from Wessex Archaeology's Sheffield office carried out an excavation within Wakefield Cathedral in advance of the construction of a new floor. The work revealed over 20 inhumations, which are mostly coffin burials associated with the 18th/19th century church. Many of the graves were previously disturbed, probably during Sir George Gilbert Scott’s restoration work in the mid- to late-19th century. 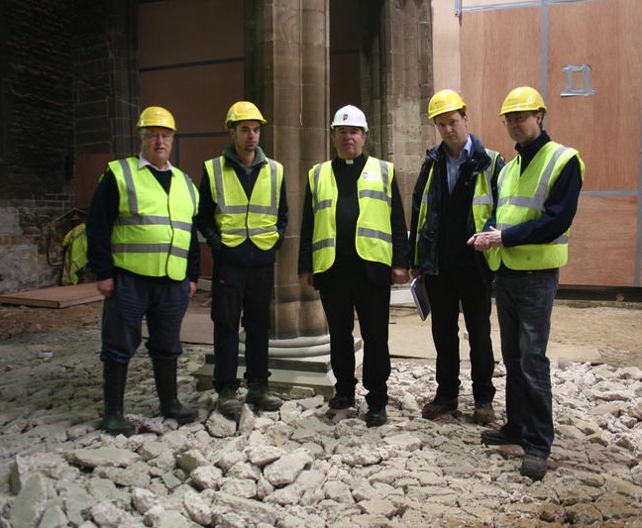 Between April and June 2012 a team from the Sheffield office carried out an excavation within Wakefield Cathedral in advance of the construction of a new floor. The work revealed over 20 inhumations, which are mostly coffin burials associated with the 18th/19th century church. Many of the graves were previously disturbed, probably during Sir George Gilbert Scott’s restoration work in the mid- to late-19th century, and any remaining bones have largely decayed, leaving only a calcified skeletal outline (see photo left). 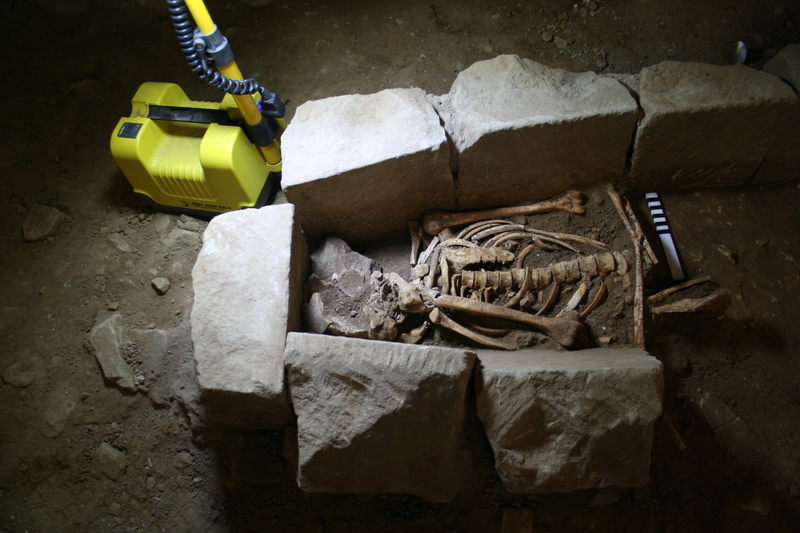 Two medieval stone-lined graves/cist burials have also been revealed, which are assumed to lie to the south of the original 12th century church, prior to its expansion in the 15th century. The earliest burial has been radiocarbon dated to between 970 and 1150 AD. We have also revealed early walls and carried out a watching brief during internal renovation work. The walls form part of the 15th century north porch and part of an unknown structure to the west of the 12th century church. A watching brief during work in the cathedral is on-going. WA Chairman Robert Key (far left) paid a visit to the project recently as well. Robert and Chris Moore visited the project and spoke to The Dean about the project and the work that WA was undertaking there. It was a very successful visit and Robert enjoyed meeting the Sheffield Office, the project team and visiting some key contacts in the Northern Region. Off site we have now completed the post-excavation work. 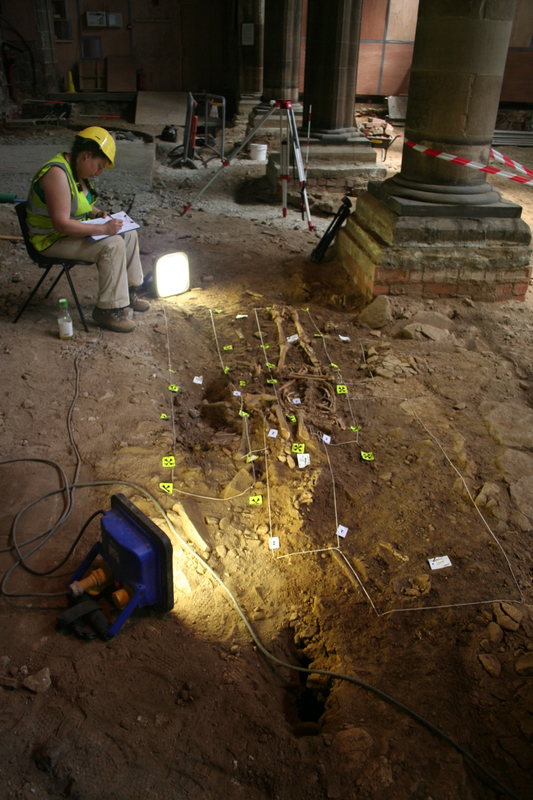 Alistair Barclay’s analysis of the radiocarbon dates from the stone lined cist burials, has placed Wakefield Cathedral’s origins firmly in the late Saxon period – the first firm evidence for the church’s suspected pre-Conquest origins.